Apple’s long been highly-ranked in a number of business-related lists, but on Monday, Fortune announced that the company had jumped into the Fortune 100 list for the first time since 1994, coming in 71st place. That’s a 32 spot improvement on last year, when it ranked just outside of the crème de la crème at 103. 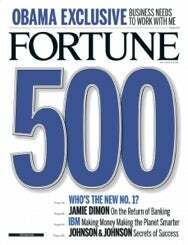 The Fortune 500 is the magazine’s ranking of the largest corporations in the U.S. based on their gross revenue (and adjusted for certain taxes). Despite long being a member of the prestigious Fortune 500, the last time Apple made it into the Fortune 100, the world was a much different place. The U.S. was only in its first-year of the Bill Clinton presidency, Schindler’s List had taken home Best Picture, and Apple had only just started releasing computers with PowerPC processors, running Mac OS System 7. Steve Jobs wouldn’t return to the company for another five years. It seems a little hard to believe that the company never made it back into the Fortune 100 after Jobs re-took the helm, but clearly his impact plays a major part into helping Apple reach this point. Several of Apple’s competitors are also holding spots in the Fortune 100, including Hewlett-Packard at nine, Dell at 33, and Microsoft at 35. Google ranked 117th. This year’s list was topped by Exxon-Mobil and Wal-Mart, which swapped places from last year: even in tough economic times, you can apparently count on gas companies and retail giants to bring home the bacon.